As the Queen Angelfish gets older, its baby colors begin to fade and it begins to look more and more like an adult Queen Angelfish. 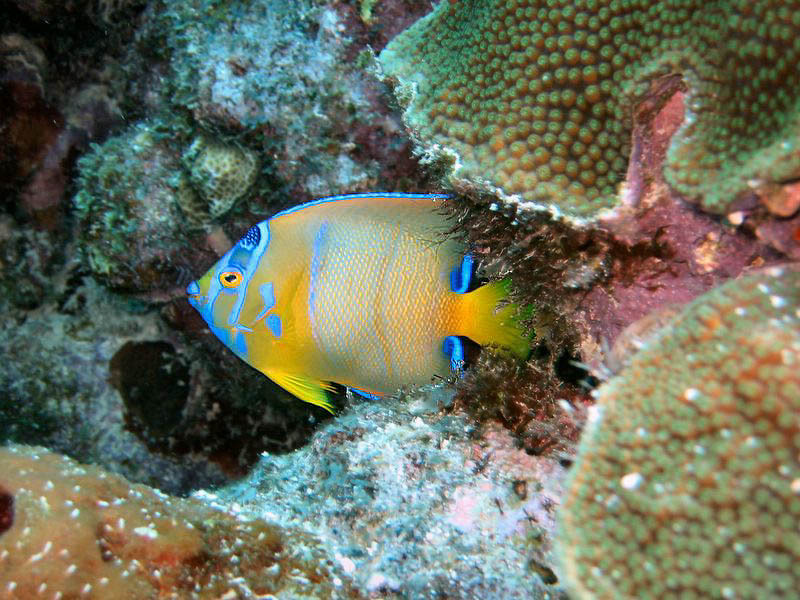 The Queen Angelfish in this picture is an older juvenile and may be nearly 10 inches long. The juvenile Queen Angelfish is outlined in turquoise blue like an adult. But the red coloring inside this blue outline is beginning to fade to yellow. Its yellow body is not as bright, and the two vertical blue bars on its sides are fading. It still has two vertical blue bars on its cheek, one on either side of its eye. But the "crown" of dark blue outlined in bright blue and filled with blue spots is getting easier to see. Compare this crown to the head of the baby Queen Angelfish. ReefNews photographer Dave Knapp took this picture near the island of Curacao in the southern Caribbean in May 2005. Dave Knapp lives in California.